Thanks for printing! Don't forget to come back to Wings Over Washington for fresh articles! Take a ride in the state-of-the-art "flying theater" that will transport you on an aerial adventure above one of America’s most scenic and beautiful states, Washington. Wings over Washington is currently the most state-of-the-art theater in the world using 5K cameras; innovative art laser projection; drones for image capture; MUSHROOM VR™, and a ground-breaking surround sound system. 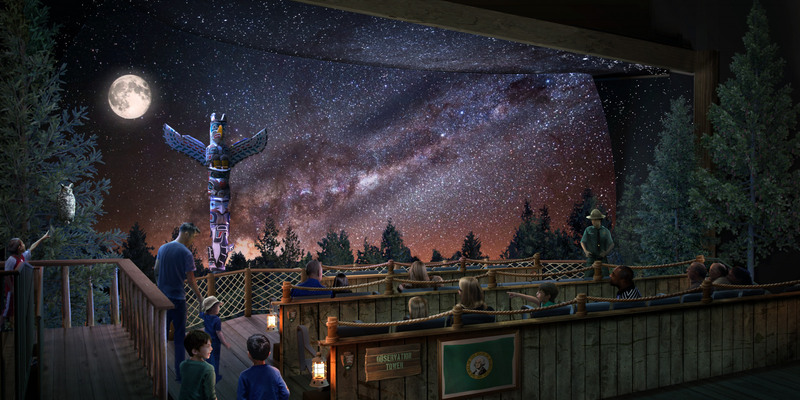 Once you are strapped into your theater seat, you will experience an amazing journey as a "spirit eagle" sweeps you upward into flight across the state of Washington. 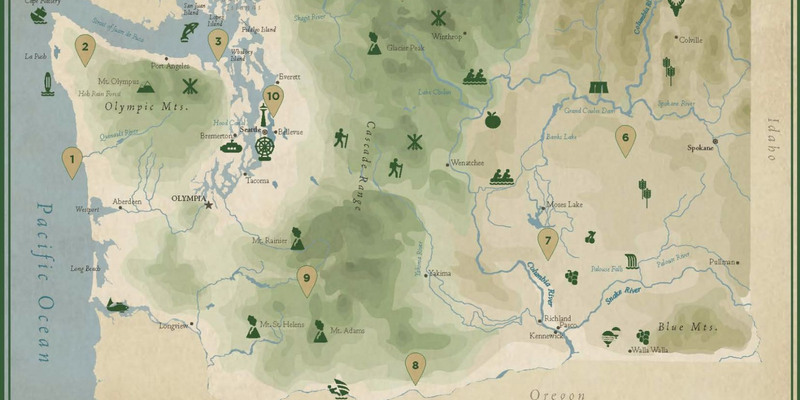 You will see amazing sights and experience the smells of Washington as you dive down the seaside cliffs through the morning mists of the Olympic National Forest and Mt. Rainier to the San Juan Islands and on to the spectacular beauty of the Cascades and the awe-inspiring Snoqualmie Falls to the wild whitewater of the Tieton River and the kaleidoscopic wonder of the Walla Walla Valley Balloon Stampede then back to Elliot Bay to bank around the Seattle Great Wheel as a sensational fireworks display begins and then slowly landing back to where the journey all began. Must be at least 3 feet 4 inches (40" or 101 cm) tall to ride. Children under the age of 12 must be accompanied by an adult or guardian aged 14 years or over. 1. There are no refunds or exchanges provided on any tickets. This ticket is deemed void if altered in any way. Resale of Wings Over Washington tickets is prohibited. 2. Due to seating configuration limitations, we cannot guarantee that all members of your group will be seated next to each other. Animals are not allowed on board for their own safety. Luggage, backpacks, large bags, umbrellas, walking sticks, and other large or heavy personal items are not allowed onto the ride. Food and drinks are also not allowed into the attraction. 3. To ride, guests must be a minimum height of 40” or 3 feet 4 inches (101cm), a maximum height of 76” (195cm), and a maximum weight of 300 pounds (136kg). All riders must be able to assume and maintain a normal sitting position, hold themselves tight during the ride, and be held safely by the passenger restraint system (safety belt). Children under the age of 12 must be accompanied by another guest aged 14 years or over to enter the attraction. 4. Photography and video are strictly prohibited while inside any part of Wings Over Washington. 5. Passengers will be exposed to loads far exceeding their normal weight. Pregnant women and guests with health problems should not ride. Guests with known heart conditions, back or neck pains, high blood pressure, or who are prone to motion sickness, dizziness, claustrophobia, or other conditions that could be aggravated by simulated motion or flight, should not ride. Similarly, guests with photosensitive epilepsy or who have conditions aggravated by visual stimuli such as flashing lights should not enter. 6. Ticket holder agrees not to engage in any acts that could jeopardize the safety or enjoyment of other visitors. Guests must remain seated at all times and shall not lean or stretch our arms or legs during the ride. All loose clothing and personal items must be secured before loading. Intoxicated riders will not be allowed to ride Wings Over Washington. Wings Over Washington reserves the right to evict any guest found to be in violation of safety protocols. 7. ARBITRATION/WAIVER OF JURY TRIAL: PASSENGER HEREBY WAIVES ITS RIGHT TO A JURY TRIAL FOR ANY DISPUTES ARISING FROM THE PURCHASE OF THIS TICKET AND/OR PASSENGER RIDING WINGS OVER WASHINGTON. ALL SUCH DISPUTES ARE EXPRESSLY AGREED TO BE SUBMITTED TO BINDING ARBITRATION IN WASHINGTON STATE THROUGH THE AMERICAN ARBITRATION ASSOCIATION. 8. ASSUMPTION OF RISK: Ticket holder voluntarily assumes all risks and danger of personal injury arising from or related to Wings Over Washington attraction, including without limitation any injury, damage, distress, illness, inconvenience or anxiety caused during the course of any ride and/or during evacuation from the attraction in the event of breakdown or accident. Ticket holder agrees that Great Western Attractions and its directors, officers, owners, partners, employees and agents are expressly released from any claims for damages related in any way to ticket holder’s attendance at Wings over Washington. 9. Use of this ticket constitutes acceptance of these terms and conditions. Purchaser and/or bearer of the ticket grants permission to Wings Over Washington and Pier 57 to utilize the holder’s image or likeness on photographs or video created for Wings Over Washington and Pier 57 promotional purposes. Want to know all the places the ride takes you? Or are you in a heated debate on which mountain that really was? Recap your flight with the companion coffee table book that shows you in detail all of our beautiful state. See MORE of Washington. From the stormy Washington coast and lush dark green of the Hoh Rain Forest to the stark and arid high desert and wheat-covered hills of the Palouse, the state of Washington is home to an incredible diversity of ecosystems and organisms—including the humans who hike its mountains and swim its waters. Where else can you find both the wettest place in the United States and the quietest? Or five active volcanoes, including one that blew its top not so long ago? Filled with stunning photographs and elegant descriptions, this book offers a comprehensive exploration of the remarkable region known as the Evergreen State and provides readers the opportunity to bring their experience home. I just purchased tickets online, do I have to use them the same day? It did not ask what day/time I want to ride. What is the duration of the Ride/Experience? Can I make reservations? The entire experience is approximately 15 minutes to complete. We do not take reservations and load on a first come first serve basis. We load people into the ride every 10-15 minutes. The average wait time is 10-15 minutes, and when we are busy wait times may more than 30 minutes. Holiday weekends tend to be the busiest days of the year where wait times can be over 1 hour. Passengers will be strapped into their seats and taken on an aerial adventure over Washington. During the course of the show, you will experience mist in your face as you travel over water, the smells of the images you are seeing (example cedar smell as you glide through the forest, three fragrances in total), sudden up and down movements with momentary weightlessness, and extrasensory visual stimulation including bright lights and flashes. Persons sensitive to misting, artificial fragrances, sudden motions, and bright lights and flashes should be aware of these additions to your experience while you ride Wings Over Washington. The manufacturer also recommends that pregnant women do not ride without consulting your doctor. I have an infant in a baby bjorn, can they ride on my chest in the bjorn? Our ride specifies everyone must sit in their own seat, be fastened by the restraint system and must be a minimum of 40" tall. We cannot allow any children to be held in arms, laps, or baby bjorn. We are happy to accommodate parents that want to "switch off" in order to watch the children. Please notify the WOW ranger if you need assistance. I want to purchase tickets as a gift. Are there gift certficates available? How do I get them? We don’t have “gift certificates” per say, HOWEVER, since the tickets never expire and are not day or time specific, you can simply purchase tickets online, print at home, and give them as gifts. All tickets purchased online are printed at home yourself. When you make an online purchase, you will want to enter the recipient information first. This can be the family name, or the name of a charity/group if you are giving the tickets to an auction or as a prize. Then you will UNCKECK the box that states “my billing info is the same”, then enter your correct billing information. This way their name will print on the tickets, not yours. If you are giving tickets to multiple groups/sets of people, we reccommend you make one purchase per group as the group name will be printed on every ticket in one purchase. If you want separate group names, make separate purchases. Group name will not make a difference to us when redeeming the ticket; we simply need one valid ticket per person to board the ride. Where can the coffee table companion book be purchased? 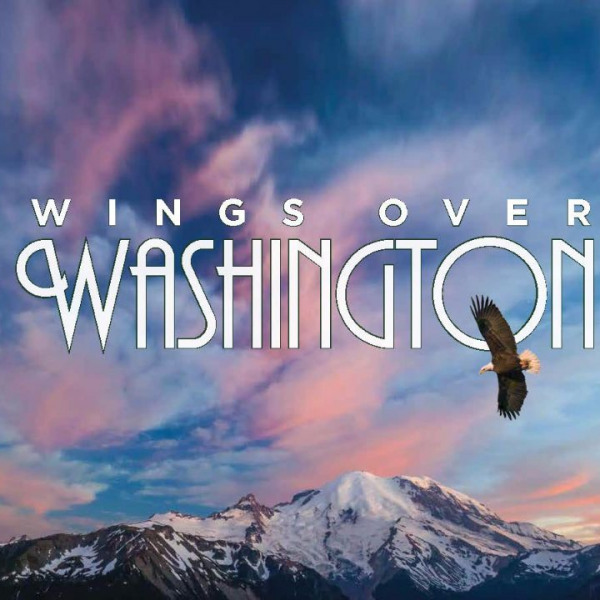 A visually stunning companion coffee table book to the state-of-the-art experience of the same name -- "Wings Over Washington" -- will be available at Miner's Landing and on Amazon.com. You can also visit Pirates Plunder on Pier 57 and see all of our Wings souvenirs as well as purchase the book in person. 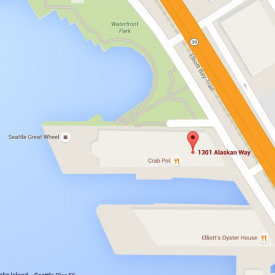 What is the handicap/mobility impaired accessibility like? What should we expect? We are wheel chair accessible with two different viewing options. If a guest is unable to climb two sets of stairs, we have an elevator that leads to the Wings Over Washington theater room. Please notify the Ranger at the front door that you will need mobility assistance. If you use the elevator, the rangers will give you pre-show safety information verbally. Wheel Chair users: Once you roll into the theater room, if you can transfer out of the chair and into a seat, then you can ride on the moving platform. If you cannot transfer out of the chair, we have a separate viewing area with a monitor so you can still watch the movie, but will not be in the main movie theater. We need to make sure that each person can be firmly held/secured in the seat with the seat belt in order to allow someone to ride the ride. If they cannot be firmly held in the seat with the restraint device, then that person cannot ride regardless of if they walked into the theater, or if they rolled into the theater. I use a service animal-is it safe for them to ride? As with all “flying theaters,” we are unable to accommodate service animals on the ride because they cannot be securely fastened to a seat as the ride is moving and pitching through the movie. Also, the sudden moments and nature of the ride would be scary for them. Those who require constant service animal assistance have the option of watching the movie on the accessibility screen instead of the moving platform in order to enjoy the show. What technology is used to create the experience? "Wings over Washington" is currently the most state-of-the-art theater in the world using 5K cameras; innovative art laser projection; drones for image capture; MUSHROOM VR™, and a ground-breaking surround sound system. Who composed the score for the aerial ride? The famed Antonio Di lorio composed the majestic score which was played by Northwest Sinfonia and brought to life by the the vocal and instrumental talents of 30 members from the Sacred Water Canoe Family Choir. Are there similar experiences elsewhere? While "Wings Over Washington" offers the most technologically advanced ride experience in the world and is the only one to feature the scenic state of Washington, there are flying theaters in Vancouver, Europe, as well as at some of the Disney Theme parks located in California, Orlando and China. Do you fulfill donation requests for auctions and charities or other worthy causes? To request a donation, please email us at: [email protected] We will enter you into our weekly drawing for fulfilling donations. You can submit one single request for Wings Over Washington AND The Seattle Great Wheel which will be combined into the same donation request pool. Please submit only one request. Submitting two requests will not increase your chances of being drawn-only one entry is allowed per group. Please do not mail your donation request-we prefer all requests via email. How do I redeem my photo digital download after I purchase my photo?